I'm really in to bright lips at the moment...perhaps because the weather is so miserable at the moment so I'm experiencing spring/summer via my lip colour. Anyway, I'm loving it. This lipstick is sooo exciting. I've only just got it. I'm not usually one to buy from the MAC collections but this colour screamed 'buy me now', and you can't ignore a talking lipstick! It is called Watch Me Simmer and is sold out in all of our local MAC shops so I had to order it. I's a lot more orangey than I remembered it being in the shop but I am so happy with it. This next one is Impassioned, one of MAC's best-sellers I believe. This and Watch Me Simmer are the Amplified formula, so really strong long-lasting colour which tends to stain the lips........it was a mistake to photograph these 2 first; it took a while to get my lips back to neutral for the next colours. I actually bought this one a few weeks ago when I wanted Watch Me Simmer was sold out in store. I was craving a similar bright, this colour has more pink in it. It stays on for a good few hours. This beauty is from the L'oreal Riche blondes collection. I love the colour but even better is the smell, exactly like parma violets. Yum! It's called Magnetic Coral. Until recently I always avoided coral as I wasn't sure if suits me, however this one (and the Dating Coral from L'oreal Caresse) is not too orange and so looks quite good on pale ole' me. This colour is Aphrodite Scarlet, one of the amazing L'oreal Caresses (my choice over the lip butters any day). Not quite sure why it's called scarlet, and it's more a red-pink. I like it although I think it would look better on warm-toned skin. It is very sheer so a good option for those a bit scared of bright colour. On a side note, I had forgotten there were freckles on my lips until I saw these photos. 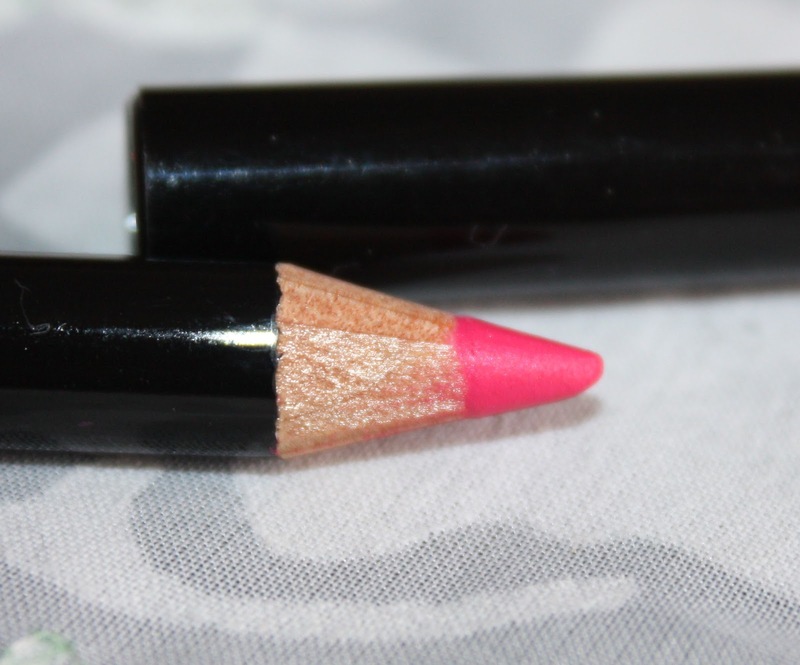 Another L'oreal Caresse, this is Impulsive Fuchsia and is my current go-to colour. It's a blue-toned pink, again sheer but with enough colour to stand out. I was wearing it yesterday and a male friend commented on how bright it was. I was thinking "you should see some of my other colours!" This was my first Topshop make-up purchase. It's called Infrared and is a very bright reddy-orange. I'm not convinced it suits me but I don't care. I love it. I thought I would include a few lip glosses. They don't look as bright on but when combined with lipstick or lip pencil they can be just as vibrant. 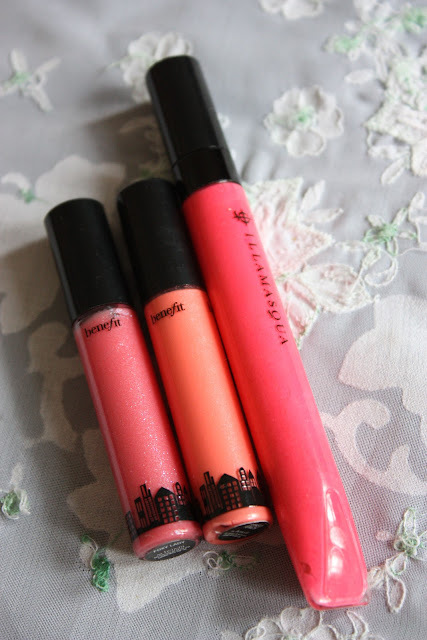 Both of these Benefit Ultrashine lipglosses came in the Ticket to Glossytown set which I got on sale at Debenhams for, I think, £13. Foxy Lady is a warm pink with cooler glitter, good alone but amazing on top of a lipstick. Spiked Punch is a coral colour. It's one of those glosses that definitely looks a bit better once you've been wearing it a while. I have quite a lot of lines in my lips; the gloss doesn't settle into them too much but does go a bit patchy. A really nice, summery colour though. This is Illamasqua's Induge which I LOVE. This photo does not do it justice. The gloss is highlighter pink! It's a very thick gloss so I find that the best way to apply it is to dot it around the lips and then just smoosh your lips together a lot. This gloss is a recent purchase. It's part of the Bourjois 'smile enhancing' collection. The glosses all have micro particles that are supposed to make your teeth look whiter, while the other end contains a clear gel which you put on your teeth. I think you'd have to use the gel a lot to make any difference, I certainly haven't, but it is minty and I do enjoy that. The colour is 05 Framboise Hollywood. There was a lighter pink colour which I also liked, think it was called something Fraise. Last but not least is my choice in bright lip pencil. To be honest, there isn't much choice. I went around all of the drugstore brands in Boots and Superdrug looking for a bright pink pencil and didn't find a single one to satisfy me. I bought this one, by NYX, on Amazon for about £3 (we don't have NYX in stores in the UK). It is called Hot Pink and is exactly what I was after. I find that my lips to tend to need a liner just because my natural lip line has been destroyed by years of cold sores; my edges are all a bit blurry. Hope you've enjoyed that onslaught of colour. What are your favourite brights? Which do you want to buy? The next bright lip colour I want to get is MAC's Girl About Town, I know the world and her dog has it but it is beautiful. Just as an afterthought, if you're after some cheaper bright lipsticks I've quickly swatched two MUA colours to show you. These can be found for £1 each in Superdrug. They are quite glossy so do not stay on the lips that long but for that price you can afford to reapply as often as you like!